I’ll highlight the benefits, but if you want background information, then refer to the previous post. This post will go over the REST library and how it can be used to minimize the amount of code required with interacting with SharePoint. The library is available on npm and github. Generates the REST api url and formats it for app webs automatically. Global flag to execute requests on creation, to reduce the number of calls to the server. Parent property for easier development. Switch between asynchronous and synchronous requests by the object’s property. 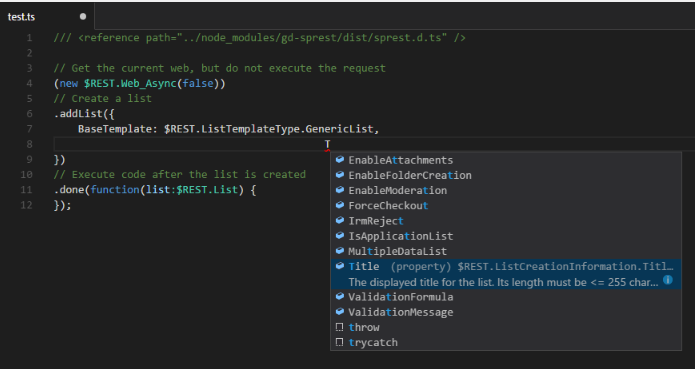 Written in TypeScript with definition file for intellisense. This is probably the most important one, the abililty to have all the properties and methods available in TypeScript. A global flag is used to determine if an app web request should execute against the host web or current web. Refer to the documentation on github/npm for additional details on interacting w/ other webs. If set to true, the request will use the “SPHostUrl” query string parameter. This flag can be used to flip back and forth between requests. I’ve found this useful when needing to copy files between the app web and the host web. * asyncFl – Flag to determine if the request should executes asynchronously or synchronously. * bufferFl – Flag to determine if the output of the request is a file stream. * callback – Required for asynchronous request. Executed after execution. * data – Template used for passing the method parameters in the body of the request. * defaultToWebFl – Flag to determine if the url should default to the current web url, site url otherwise. * method – The request method type. * endpoint – The api endpoint. * url – The server relative site/web url to execute the request against. Since the library can be executed synchronously, the user can execute commands in the browser’s console window and interact with the SharePoint site in a command-line interface. Note – The commands will execute under the security of the current user. Note – SharePoint online may reject synchronous requests. It’s better to use asynchronous requests. * Expand – A collection of strings representing the field names to expand. * Filter – A string representing the filter to apply. * OrderBy – A collection of strings representing the fields to order by. * QueryString – A read-only property representing the query string value of the oData object. * Select – A collection of strings representing the field names to select. * Skip – The number of objects to skip. * Top – The maximum number of objects to return. All availabe objects having an api entry point, will have the following constructors [Object] and [Object]_Async. The “asyncFl” property can be set to true/false to flip between the two request types. Note – My recommendation is to execute asynchronous requests, but like the ability to choose. The point of this library is to reduce the amount of code required when interacting with SharePoint. If you want a content type, list or list items, I really just wanted to the ability to get this information in one line of code. Here are some examples I believe you will find useful. Refer to the documentation on github/npm for a full list of examples. Note – I wanted to show the ability to switch between asynchronous and synchronous requests. Note – The update can take multiple parameters, based on the fields you want to update. I hope the above examples are helpful and make life easier for SharePoint developers. The above examples are not ALL the options for interacting with SharePoint. I wanted to give examples of how you can utilize the library and ensure it was flexible to handle whatever you need to do. Please report bugs/issues on github. Feel free to contact for help related to SharePoint 2013/Online Development. If you have a need for a SharePoint 2013/Online (Classic) or Online (Modern) SPFX WebPart/Solution developed, feel free to contact me for services.